[4:32] how do you find the right people to join your business? [8:47] Do like-minded people work better than the opposites? [14:14] Is it worth engaging on Facebook to find prospects? 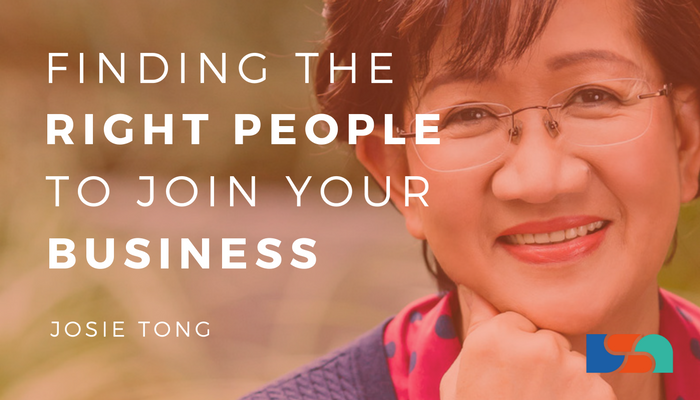 [0:41] Jen: Today we have Josie Tong joining us, Josie is from a global direct selling company in the Health and Wellness space and we’ll be talking to her about Finding the Right People to Join Your Business. So welcome, Josie can you tell us a little bit about yourself? 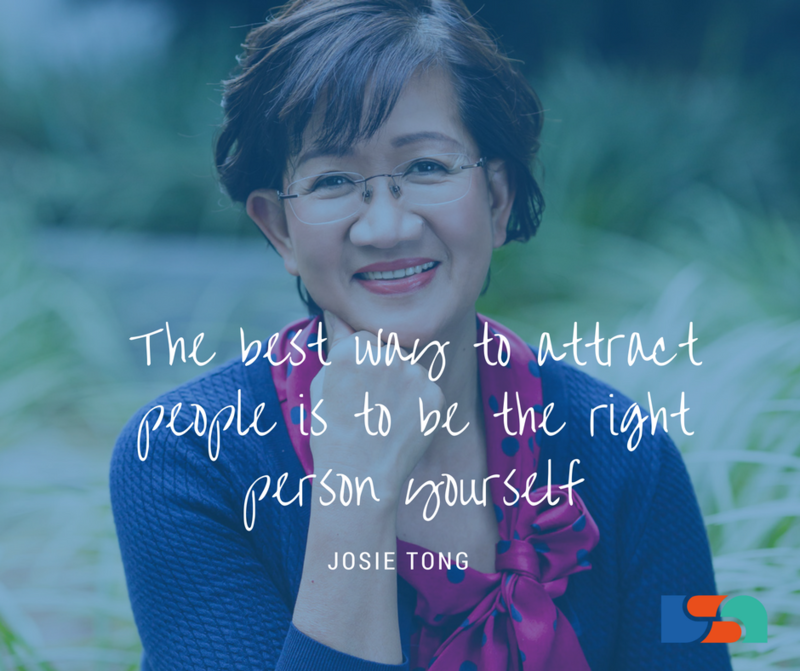 [0:54] Josie: Hey Jen, thank you for the opportunity to share on this platform.So, I arrived from the Philippines to Australia thirty one years ago and lived in Sydney for thirty years now. I’m a mother of two beautiful girls and life is pretty good because I’m able to work from home. It’s been a blessing as I raised these two amazing young women. So my career background Jen is nursing, so not long after I finished my nursing studies I stumbled into age care management. Most of those nursing career I worked as director of nursing for seventeen years and I can tell you I was a workaholic. I work long days including most weekends. So as soon as I put the kids to bed at night I would do more work and e-mails and it is just one of those jobs where it’s just never ending. So many years I’ve been doing this I just found myself burnt out in 2009 and I wasn’t able to function physically, mentally and emotionally. I didn’t know that I was burnt out so I quit my job where I was earning six figure with all the perks of management and I’m just so happy that I stumbled into the direct selling so here I am now. [2:01] Jen: So why did you get involved in direct selling? I mean to jump from the nursing career and age care it sounds like you’re doing really well besides the lack of work-life balance, why direct selling? 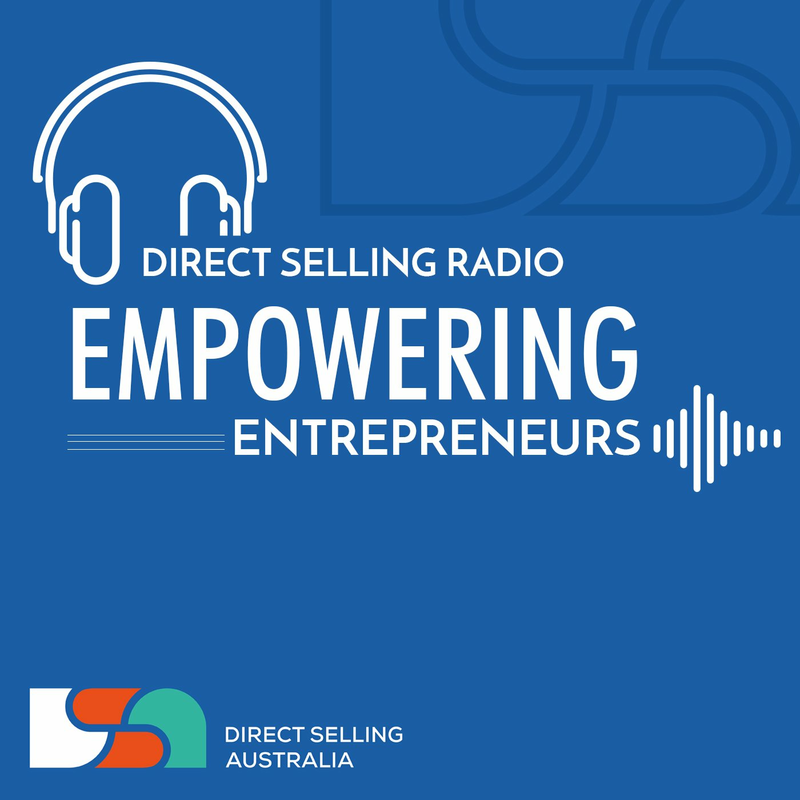 [2:13] Josie: Well you know in 2009 I spent thousands of dollars to set up my nursing agency and it was a couple of months before I was due to open the business when I was introduced to direct selling. Initially I joined because of the products but what I quickly realised Jen was that there was a huge potential in the business. I attended a couple of meetings and I really researched the business opportunity so I just didn’t push through with that business and I started to focus on direct selling instead and really it’s like I said earlier it’s one of those decisions that I have made that really has served me well and is going to serve my children as well and so I never looked back. In fact, I wrote a blog in my website about how I found my purpose in network marketing. Because I believe that I was born to help others and really it has manifested in many things that I did since I was young was to help my family and of course I ended up helping hundreds of people when I was working and now in this profession I know that I have already inspired and made an impact to thousands of people around the world and that’s what I’m really excited about, making a difference. [3:25] Jen: Sounds like you had quite a journey. Do you think that if you weren’t in direct selling that you’ll be a different person or how is that changed you? [3:34] Josie: Well, Jen, I think that if I wasn’t in direct selling I would have pursued my nursing agency and I believe that I would have done well but I would not have the flexibility of time that I have now. So in fact last December, I was able to take my kids to the US where they had a blast. We visited ten states. We went to twenty cities in thirty eight days. [3:56] Jen: Wow! That’s like a Contiki Tour …. [3:58] Josie: Absolutely, so really the time freedom and flexibility and the residual income has allowed me you know to make up the times that I lost when my daughters were growing up. Because to be honest you know I couldn’t even remember most of their milestones when they first walked, when they first talked. So being able to work from home now I mean it’s just a real blessing. So we’re planning big, me and my two girls in 2018 December we’re doing our next thirty eight day trip to Europe. [4:32] Jen: Wow! That sounds exciting, I’m very jealous right now. So as I mentioned today we’re talking about Finding the Right People to Join Your Direct Selling Business and I think we can all relate and say that these can be quite challenging you know when prospecting, there kind of seems to be two main schools of thought out there I think Josie, you’ll probably agree, the first is kind of ask everyone, you know, literally prospect anyone you come in contact with which you know has risks and enormous amounts of rejection probably. Others can decide on a target market and only focus efforts there but you know, in a really big way. I think often when we pre-judge someone we turn out to be completely wrong. So it’s really hard which way you go is it a combination of both those methods, is it sort of situational, so I’m really excited to talk to you, Josie about what your ideas are and learn about how you do things so can you share with us what you’re thoughts are around this, how do you find the right people to join your business? [5:30] Josie: Well Jen I can tell you that when I first started I was talking to everyone and I taught my team to talk to everybody. I didn’t understand for a very long time about you know how to sort my list and most importantly, know my dynamic avatar, my ideal client and I think that’s really important to identify your ideal client so it becomes easy to spot who it is that you want to be working with and you will be able to create your invite, you’ll be able to create your elevator speech or presentation to suit that market because you’re really clear, you know their problems, you know what keep them awake at night. So as I mentioned earlier Jen I missed out on my kids milestone before they were in primary school so for me my target market really are parents and people who would-be parents or struggling with quality time with their children, parents who are exhausted because of working long hours and are looking for other career options. I’m really passionate about inspiring and helping people to find out about the direct selling business because I believe that we have the vehicle to be able for people to be able to create something where eventually they have more time and lot more flexibility and you know they will have the income to give their children the best life experience. So now with social media, I mean, it’s really amazing now how you could really find your target client you can brand yourself accordingly much easier than before, Jen. [7:04] Jen: You mentioned before that when you first started in this business you were prospecting everybody, you’re asking everybody, your team is asking everybody tell me about that what were the results, how did that work and was it positive? [7:17] Josie: Yes of course, Jen. When you talk to anyone you will get people to try your products you will get people to join so you know I learned then that yeah, when you talk to so many people there will be people that will join, that will be people that will take your products. But I learned in the long term that if you were to build a stable tribe that is solid it would be best to identify your ideal client so that you know how to serve them you don’t waste a lot of time, you know how to really bring the message to them I think that’s more effective. [7:49] Jen: So tell me about someone in your team who focuses on a selected and target audience and how does this go for them? [7:57] Josie: Well, you know Jen I know someone whose target market are customers who want to lose weight you know they want to regain their energy and just feel amazing with the products, so this lady went on to build a huge community of customers globally, consistently in the top hundred income earner of the company of over two hundred thousand distributors. [8:17] Josie: Yes, so I think that it’s just amazing that when you create what you can create when you just do and focus on a targeted audience because you are clear with your message as I said earlier you understand their pain what keep them awake at night and what would be a possible solution. So I know that many people are stuck doing their daily grind because they have to and also because they don’t take the time to evaluate what they’re doing and you know what their purpose in life is and that’s where I was many years ago, Jen. [8:47] Jen: A common phrase we hear is “people follow people and people want to work with the people that they know, like, and trust”. Can you share your thought around these with me, do you think that people are naturally attracted to like-minded individuals or can opposite work together or can you even complement one another? What are your thoughts around all that? [9:06] Josie: Yes, I believe that is the case, that people want to work with people they know, like and trust. Trust takes time to build and that’s why I believe that we need to establish the rapport, the relationship. I guess that’s what why they called relationship marketing so to be honest I would rather work with people that I know, like and trust. I’ve had many people that join our organisation because of the like and trust factor. But for the opposites, I think it’s also good to have a mix of different personality types or personality relation types in your organisation and I think it’s crucial in building a fast growing organisation because you really you wouldn’t want a team or people are all like the Phlegmatic type of personality for example, there will be no fun and excitement and of course you know you wouldn’t want everybody to be what they call Choleric because you would have a group of people bossing each other around right? [9:58] Jen: Absolutely, so can you tell me about the time when you felt drawn to someone in your life whether it’s work or personal and when you felt that you just want to spend time working with them you know, what was it about that person that made you feel that way? [10:11] Josie: Yes, well I can share about this lady who was cross line to me and we work really, really well together because we’re alike in many ways. She’s my go to person in business because she’s also bold and she says how she feels and really great to be able to debate about topics that are essential in moving our businesses forward and what our challenges are, what’s growing our business so it’s great you know, imagine having all your team or your leaders are like that so I’m so really blessed to have this person in my life. [10:44] Jen: So what kind of method I know you mentioned some earlier but if we can just go through them a little bit more detail. What do you use finding people, so do you actively get out and about or you’re using social media, you’re meeting through friends, family, combination, where you meeting people, I’m so interested to know? [10:59] Josie: Well, with the advancement of technology there’s Facebook. LinkedIn has become an incredible platform to connect with anyone in the world so for me I meet and connect with people as I get out and about. I join women’s business networking events. I attend seminars where my target audience go to. For example, not so long ago I paid $800 to attend an event where my target audience is. It’s completely different industry but I know that’s where they will be and I managed to connect to a couple of the big players in that industry and I’m so looking forward to being able to serve that particular industry that I left ten years ago thru my products and my business opportunity. [11:40] Jen: So to find the best people for your team you know you need to connect with them and be where they are. So if we were to put our thinking hats for a second, do you think you can come up with few places to meet people that might be interested in health and wellness or you know parents, what do they like where do they hang out, what are they doing for fun, what books do they read when you can answer these questions, we can probably start to narrow down some of the search, obviously in health and wellness company many of your team like you said are probably looking at gyms and health clubs and that sorts of things but for you you’re looking for more that mums, she’s frustrated she doesn’t want to be doing the grind anymore so tell me about your less obvious ideas in meeting your target audience. [12:22] Josie: Yes, well I believe that many people who need to be interested in health and wellness are really sitting behind their desks; they’re working very long hours. [12:33] Jen: Are you talking to me? By the way I feel that’s me. [12:37] Josie: So many people are in these situation, right? They are so busy to think about their health being a priority because literally they do not have the time. That’s why I believe that people can find ways to connect with those, if people can find ways to connect with those people and bring awareness and education on how their products and service can help them and teach them about really making their health a priority again, so I believe that could really be a game changer in their business because a lot of times we’re looking where the obvious is but everyone is looking. You know I heard my mentor say that if people are zigging you need to zag you know, people are zagging you knew zig. So I think like okay, why am I looking in the gym when so many people are looking where the marathon runners are but really, for me I want to serve the people that are behind their desk. I want to serve the people that are stressed out because I know what it’s like, you know, I was in that situation where I was just working and I thought I look after myself because I went to the gym and all that but really time to reflect to making myself a priority wasn’t something that you know even came to my mind so I mean if someone came to me before and talked to me about health and wellness, I would have been interested. I would have done something because at that time you know can you imagine working long hours you know the energy level wasn’t so good, so I would have been happy so now I believe that if we go and find those people that are working long hours sitting behind the desk it could be a game changer in our business. [14:14] Jen: Very clever that’s an interesting one. So we talked a little bit about social media you know, you talked about how easy it is to be able to target people these days through those kind of channels and many people I speak to kind of look for groups and pages on Facebook and other online platforms that are able to connect with people that might be likeminded, they’re searching for people who are active users making comments, likes, agreeing with status updates on pages even relating to entrepreneurship or success do you ever do anything like that or anyone in your team do that? Is it successful? [14:49] Josie: Yes, I do engage with people that are in specific groups Jen and of course I would like to get better at doing these for sure. I know that many people that are in our industry are doing very well with using their online platforms to grow their customers and find people in their team and I know that you know online platform, the social media platform really is an excellent way for us to be able to brand ourselves especially in our profession, but we have to be professional at it you know we don’t want to be spamming people with our products and business opportunity. So for me It’s really a great platform for building your brand and your tribe and of course we got to get better at it every day because we want this profession to be elevated, we want this profession to be an alternative for people that are hungry for something that’s different in their life. We want this for our profession to attract people really who are professionals who are great leaders who’s going to even elevate this profession to another level. [15:50] Jen: Wouldn’t it be great if this industry became a first choice? [15:55] Jen: It’s just crazy that more people don’t know about it and more people don’t know about the impact we make on people’s lives whether it’s in a business or financial way or you know personal development way it’s just incredible. I really hope that you know soon we get to that point where we are a first choice. [16:16] Josie: Yes, and I think for that to happen is that together as a community in direct selling I mean if we do our part by becoming professional, we brand ourselves so that they see us as a profession, we’re not really running after people but we’re there to serve the people. [16:33] Jen: So understanding personality and different behaviours is really important in this business and so that we can learn to communicate with different people and how to connect. Can you share us some of your tips with us when it comes to connecting with others and sort of understanding differences in individuals? [16:53] Josie: Hey Jen, this is a very important topic that we need to be great at because I believe that understanding the different personalities will enable us to communicate more effectively with different people. For example, you know I will not be giving too many details of the compensation plan to a blue personality but instead I will talk about how much fun this person will have when this person qualifies for travel incentives and to a green personality and for sure I would give them a little bit, a lot more detail of the compensation plan rather than talking about having more fun so you know there’s a lot of great books out there and the different personalities and really how we bring our message to the different people and I think understanding that will be, we will be able to connect with people much better. [17:40] Jen: What about within your team, I mean obviously there’s a lot of different personalities and different behaviours so how do you balance and manage that? [17:50] Josie: Well, yes in fact this happened just a few months ago, I got really excited about someone who just joined our team. He had the attribute of someone who I thought would fit in well, he was driven, he had a strong reason to build business because he had young children and he wanted to spend more time with his family, but – and he’s also a sales manager and he led a large sales force but suddenly he stopped showing up and it was good that it happened because as a result I started to really qualify people first before I start to work with them because I believe that time is the biggest constraint in most people building a direct selling business so I give to people to give my time to people who deserve my time rather than people who need my time. I think in terms of the team and having different personalities it can be a challenge I can tell you that I think the most challenge that I find in this industry is really balancing people and dealing with people so I need to learn more and get better at it, Jen. [18:56] Jen: So, finally can you share the secrets of finding the right people to join your business. Three top secrets from Josie? You need to know your ideal client, know what their pains are, what keep them awake at night so that you can create your message accordingly and know where these clients hang out, is it Facebook, is it Instagram or networking events so you have to find the places or social media where your ideal clients are hanging out so I believe that knowing those three things it will help you to find the right people to join your business. [21:04] Jen: There you have it Josie’s three secrets to find the right people to join your business. I feel like I learned a lot from you today and I’m sure everybody has. A few quick questions before we finish off just a little bit more about you, can you share with us your favourite song. [21:26] Jen: And you can’t live without? [21:29] Jen: You are inspired by? [21:30] Josie: I’m inspired by people who make a difference in the world not with the material possessions they have acquired but the number of lives that they have touched because of their love for others to be better people. [21:42] Jen: Your favourite book? [21:47] Jen: Your greatest mentor? [21:48] Josie: Oh, I love these couple Marsha and Miguel Jumersa. [21:51] Jen: And you’re excited about? [21:54] Josie: Jen, I’m excited about the future, there’s so much we can do to make this world a better place and I believe that our profession in direct selling, we can help parents to be able to work from home, to have more time with their children and provide them with a better lifestyle. We have a profession that can help people in so many ways to improve their health, their personal development you know find financial security, but we have to be out there and I mentioned earlier to show people you know and to be better at it. So Jen thanks for the opportunity to share with you and your audience. I really enjoyed it. [22:27] Jen: Josie, your passion and enthusiasm for what you do is just shining through as you talk and I really, really enjoyed it, it’s been my pleasure so thank you so much. [22:36] Josie: Thank you, Jen.